Many of us are reaching an age in which our parents are leaving their long-time homes. This happened with my mom about a year and a half ago. She's got a beautiful apartment near where she and my dad used to live, but it's smaller than the house so she had to shed a lot (a lot!) of beloved belongings. One of these was an orange metal recipe box that she ended up giving me. To be honest, all this time since my dad's death and her move I've been more focused on a magenta notebook we found hiding in a bookcase while we were packing up that turned out to be recipes my dad had collected. Turns out they were mostly recipes he printed off by Dr. Andrew Weil, who my dad had been intrigued by for years. It was only last week that the orange box, sitting on a shelf under a large kitchen window, caught my eye. I pulled it off the shelf and opened it. It was like opening a treasure chest of memories, filled with recipes on index cards, some typed, some in Mom's handwriting or that of a friend who gave it to her. The names were mostly familiar, so many that I hadn't heard or thought of since childhood or adolescence. There were also her handwritten lists clearly tracking her progress in setting up for dinner parties (a habit I've adopted as well). Some are on notepaper from my dad's office, some on fragile wide-spaced lines of paper I remember from elementary school that my siblings and I used either to draw on or to practice cursive writing. Many of the recipes were familiar family recipes--kugels, chopped liver and the like. 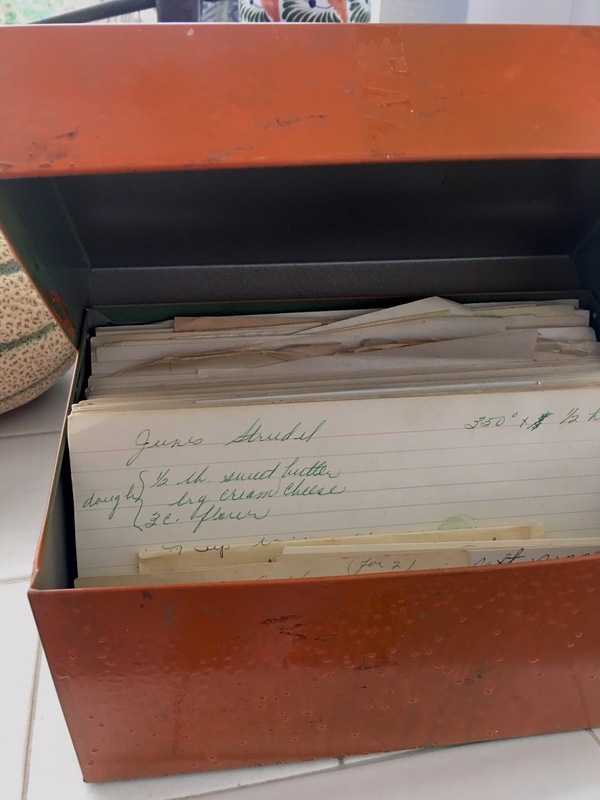 In fact, I realized looking at recipes on scraps of envelops and others on index cards that my mom and my grandmother's handwriting were so familiar I wasn't sure who wrote them out. And there are a couple of empty bags of bright yellow Nestlé's chocolate chips saved for the Toll House cookie recipe. Many recipes I'd never seen (and likely will never make; clearly of a time when convenience foods/ingredients were much more popular than today). And then there were those I'd never seen but totally intrigued me, including this recipe my mom calls Chocolate Sugar Balls. Looking at the ingredients, they clearly were chocolate chip cookies sans the leavening. No eggs, no baking soda. But plenty of butter, brown sugar, vanilla, chocolate chips, and nuts. I decided to make them over the weekend--and learned from the experience. The recipe was a little gung-ho on the nuts, so I've cut the amount in half (add them back if you like). And because there was no liquid from eggs to hold the balls together, I've added just a tablespoon of water. I've also added an amount for powdered sugar. I happened to visit my mom later in the afternoon after making the cookies and brought her about a dozen, along with the recipe index card. She looked at it and laughed. She had come up with it herself years ago, she said, to mimic a treasured family recipe we call snow ball cookies--and agreed with my changes, adding that she would also reduce the amount of brown sugar. I left it as is. I'm offering the recipe below with my changes and adaptations. The recipe makes more than 80 cookies so there are plenty to freeze and enjoy or share later. As it happened I didn't have enough semi-sweet chocolate chips but also had a bag of butterscotch chips for some reason, so I mixed them together and used walnuts that I toasted and chopped. They tasted great, so feel free to substitute chocolate chips with other flavors. The Chocolate Sugar Balls are crunchy and sweet. They're a fun bite that represent the best of chocolate chip cookies, without the debate over soft vs. crisp. And the powdered sugar is an added sweet bonus. But don't bother to sneak them. That powdered sugar on your shirt will be a dead giveaway. 1. Pre-heat oven to 350°. 2. Sift together flour and salt. Set aside. 3. Beat butter, sugar, and vanilla until well combined. 4. Stir in nuts, chocolate chips, and water. 5. Form balls, about an inch in diameter. Place on ungreased cookie sheet. 6. Bake for 15 to 20 minutes, until just browned. 7. Roll in a bowl of powdered sugar while still warm. Let cool and roll a second time. Do You Roast Your Radishes?